Box Text: "ALCHEMIC ADVENTURE RPG"
"The Art of Alchemy can be so deadly"! - Extract elemental powers from field objects for your Alchemy experiments! Use the power of Mana to create over 300 different items! - Use your Alchemy skills to battle vicious monsters! Never before seen special moves! - Over 400 Events that can occur as a result of your actions! 05-25-2018 noxie Box Text "ALCHEMIC ADVENTURE RPG" "The Art of Alchemy can be so deadly"! - In an age of peace and harmony, the power of evil is lurking in the shadows. The progeny of the dying art of Alchemy must rise to defend all that there is. Together with the forces of Mana, an alliance of fate must decide the destiny of the entire world... - Extract elemental powers from field objects for your Alchemy experiments! Use the power of Mana to create over 300 different items! - Use your Alchemy skills to battle vicious monsters! Never before seen special moves! - Over 400 Events that can occur as a result of your actions! 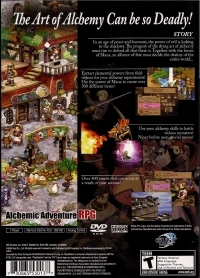 05-29-2012 disgaeniac Box Text "ALCHEMIC ADVENTURE RPG" "The Art of Alchemy can be so deadly"! - In an age of peace and harmony, the power of evil is lurking in the shadows. The progeny of the dying art of Alchemy must rise to defend all that there is. Together with the forces of Mana, an alliance of fate must decide the destiny of the entire world... - Extract elemental powers from field objects for your Alchemy experiments! Use the power of Mana to create over 300 different items! - Use your Alchemy skills to battle vicious monsters! Never before seen special moves! - Over 400 Events that can occur as a result of your actions! 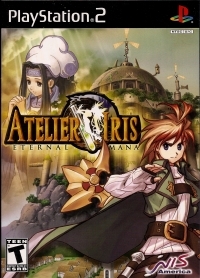 This is a list of VGCollect users who have Atelier Iris: Eternal Mana in their Collection. This is a list of VGCollect users who have Atelier Iris: Eternal Mana in their Sell List. 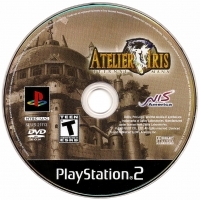 This is a list of VGCollect users who have Atelier Iris: Eternal Mana in their Wish List.